Evergreen Cultural Centre, Home Made Home, Coquitlam, BC, 2018. In partnership with Richmond Art Gallery. Curator: Katherine Dennis. Richmond Art Gallery, Home Made Home, Richmond, BC, 2018. Kamloops Art Gallery, Germaine Koh: Weather Systems, Kamloops, BC, 2013. Curator: Charo Neville. Galerie B-312, Germaine Koh - Knitwork; Germaine Koh/Gordon Hicks - There|Here, Montreal, 2012. Catriona Jeffries Gallery, Germaine Koh, Vancouver, BC, Apr-May 2008. Video Pool, Germaine Koh: Call and Relay, Winnipeg, MB, Oct-Nov 2007. Centre A, Overflow, Vancouver, BC, Jan-Feb 2007. Catriona Jeffries Gallery, Germaine Koh: Shell, Vancouver, BC, Jan-Feb 2005. Para/Site Art Space, Germaine Koh: Stall, Hong Kong, 2004. Artspace, Homemaking, Sydney, AU, May 2003. McMaster Museum of Art, Germaine Koh: Open Hours, Hamilton. ON, Fall 2002. Catriona Jeffries Gallery, Germaine Koh, Vancouver, BC, Apr-Jun 2002. The British Museum, Knitwork, London, UK, Feb-Apr 2002. Performance/installation related to conference "From Material Things: art and artefact in the 21st century". Curator: James Putnam & Gabriela Salgado. Plug In ICA and Gallery One One One, Germaine Koh: Around/About, Winnipeg, MB, Nov 2001-Jan 2002. Curator: Christina Ritchie. Contemporary Art Gallery, Germaine Koh, Vancouver, BC, May-Jul 2001. Curator: Keith Wallace. 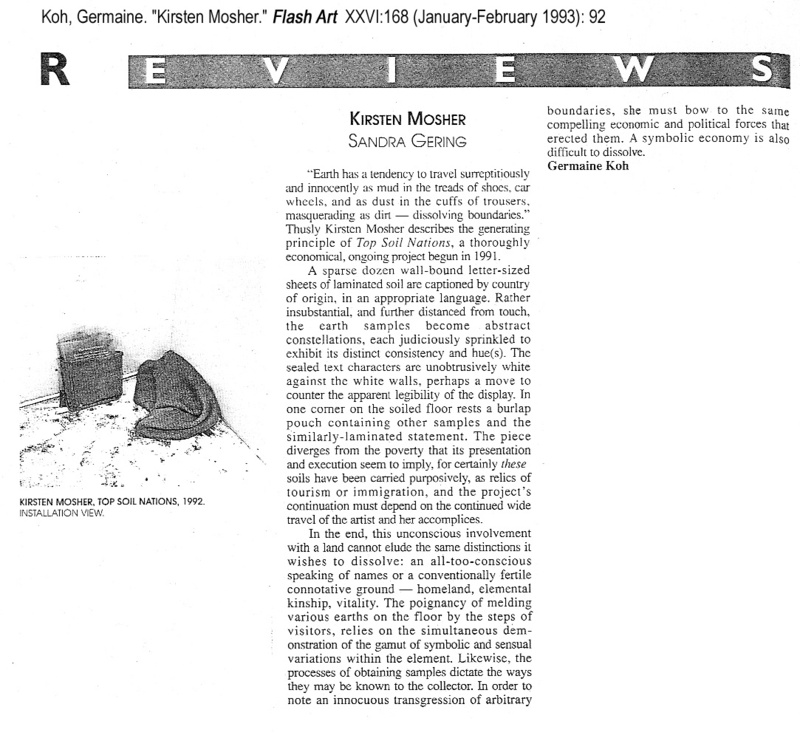 Solo Exhibition, Watch, Toronto, ON, 5-7 Feb 2001. Curator: Barr Gilmore. Latitude 53, Journal, Edmonton, AB, Sep-Oct 2000. Curator: Todd Janes. Arte in Situ / La Torre de los Vientos, by the way, Mexico City, Jun 2000. Curator: Antonio Outón & Pedro Reyes. Ex Teresa Arte Actual, En busca del nivel del lago, Mexico City, 1999. Curator: Guillermo Santamarina. YYZ Artists' Outlet, Notices, Toronto, ON, Apr-May 1998. Southern Alberta Art Gallery, Germaine Koh: Knitwork, Lethbridge, AB, 1997. Curator: Joan Stebbins. 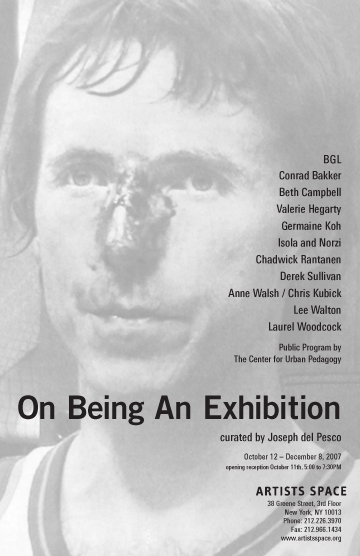 Agnes Etherington Art Centre, Germaine Koh: Personal, Kingston, ON, 1997. Curator: Jan Allen. eyelevel, Knitwork, Halifax, NS, 1996. Yukon Arts Centre, Knitwork, Whitehorse, YK, 1995. B-312, Knitwork/Tricot-âge, Montreal, QC, Sep-Nov 1993. Gallery 101, The International Code of Signals Paintings, Ottawa, ON, Aug-Sep 1991. Curator: Daniel Sharp. City of Winnipeg Public Art Program, DIY Field, Winnipeg MB, 2011. Kuenstlerhaus Palais Thurn & Taxis, SilvrettAtelier Montafon 2018, Bregenz AT, 2019. Haus für Kunst Uri, (im)mobile, Altdorf CH, 2016. Participants: Edith Flueckiger. Curator: Chantal Molleur & Mireille Bourgeois. Dalhousie Art Gallery, (im)mobile, Halifax, NS, 2014. Participants: Edith Flu?ckiger. Curator: Mireille Bourgeois & Chantal Molleur. City of Toronto, Scotiabank Nuit Blanche: Zone A Zone A: 'Restaging the Encounter' Curator: Candice Hopkins. 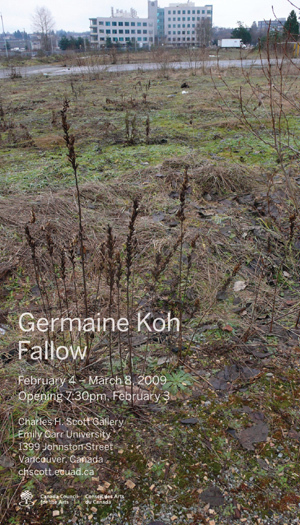 Surrey Art Gallery, There/Here: Germaine Koh and Gordon Hicks, Surrey, BC, 2011. Participants: with Gordon Hicks. Curator: Jordan Strom. Luminato Festival of Arts + Creativity, Luminato Festival 2009, Toronto, ON, Jun 2009. Art Gallery of Ontario, All Together Now: Recent Toronto Art, Toronto, ON, Nov 2008-Spring 2009. Installation of works from the permanent collection. Participants: Kelly Mark, Nestor Kruger, James Carl, Instant Coffee, Marla Hlady, Gwen Macgregor, Lewis Nicholson, Germaine Koh. Curator: Michelle Jacques. Or Gallery, This Particular Day of June, Vancouver, BC, May-Jun 2008. Participants: Alejandro Cesarco, Germaine Koh, Micah Lexier. Curator: Jonathan Middleton. Ingenuity Festival, Ingenuity Festival 2007, Cleveland, OH, 2007. Curator: Steve Dietz. Folly, f.city, Lancaster, UK, Sep-Oct 2006. ISEA / 01SJ, ISEA 2006 / Zero One San Jose, San Jose, CA, 7-13 Aug 2006. Curator: Steve Dietz. Mackenzie Art Gallery, 2004 Sobey Art Award Exhibition, Regina, SK, Jul-Sep 2006. Art Forum Berlin, Temporary Import / Vorübergehende Einfuhr, Berlin, Sep 2005. Curator: Susanne Titz. Museum of Contemporary Canadian Art, 2004 Sobey Art Award Exhibition, Toronto, ON, Sep-Nov 2005. Art Gallery of Greater Victoria, 2004 Sobey Art Award Exhibition, Victoria, BC, Jul-Aug 2005. Musée d'art contemporain de Montréal, L'envers des apparences, Montreal, QC, Summer 2005. Curator: Gilles Godmer. Yukon Arts Centre, 2004 Sobey Art Award Exhibition, Whitehorse, YK, Mar-May 2005. Art Gallery of Nova Scotia, 2004 Sobey Art Award Exhibition, Halifax, NS, Oct-Dec 2004. Touring 2005-06 to Yukon Art Centre (Whitehorse), Art Gallery of Greater Victoria, Museum of Contemporary Canadian Art (Toronto), Mackenzie Art Gallery (Regina). Edmonton Art Gallery (now Art Gallery of Alberta), Sense, Edmonton, AB, Sep-Nov 2004. Curator: Catherine Crowston. Liverpool Biennial, 3rd Liverpool Biennial International, Liverpool, UK, Sep-Nov 2004. Galerie d'Art du Parc, Entre ciel et terre - Biennale nationale de sculpture contemporaine 2004, Trois-Rivières, QC, Jun-Aug 2004. Curator: Gaston St-Pierre. YYZ Artists’ Outlet, Psychotopes, Toronto, ON, Sep-Oct 2003. Participants: Derek Sullivan, John Massey, Scott Lyall, Day Milman & & Paige Gratland, Robin Collyer, Jay Wilson, Corwyn Lund, Lisa Kannakko, Instant Coffee, Olia Mischenko, & Steve Kado, Andrew Reyes, Benny Nemerofsky Ramsay, Bill Burns, Corinne Carlson(...). Curator: Markus Müller. Frankfurter Kunstverein, Nation, Frankfurt, May-Aug 2003. Curator: Nicolaus Schafhausen. McMaster University campus, re:cycle, Hamilton. ON, 2003. Temporary public art projects. Power Plant, IN THROUGH THE OUT DOOR, Toronto, ON, Jun-Sep 2002. Participants: Nestor Kruger, David Armstrong-Six, Germaine Koh. Curator: Xandra Eden. Catriona Jeffries Gallery, Signage, Vancouver, BC, Jun-Aug 2002. Catriona Jeffries Gallery, Art - Supernatural Fairytales (Pink Island), Vancouver, BC, 2001. Biennale de Montréal, Tout le temps / Every Time, Montreal, QC, 2000. Curator: Peggy Gale. Gendai Gallery, Recollection Project, Toronto, ON, 2000. Biennale of Sydney, Every Day: 11th Biennale of Sydney , Sydney, AU, Sep-Nov 1998. Curator: Jonathan Watkins. Center on Contemporary Art, Home Remedies and Magnificent Obsessions, Seattle, WA, Jul-Aug 1995. Participants: Wilbur Hathaway, Janice Kerbel, Scott MacGregor, Raymond Materson, Gerard Menendez & Byron Lymburn, Thomas O'Day, Juniper Tedhams, Jeanne Voltura, Germaine Koh. Curator: Susan Purves. The New Gallery, Bodies of Evidence, Calgary, AB, Jun 1995. Participants: Janice Kerbel, Germaine Koh. Curator: Dionne McAffee. Ottawa Art Gallery, Monuments in the present tense, Ottawa, ON, Spring 1994. Participants: Aoife Mac Namara, Ellen Treciokas, Mindy Yan Miller, Germaine Koh. Curator: Jean-François Renaud. Agnes Etherington Art Centre, Germaine Koh: Personal, Kingston, ON, 1997. Author: Jan Allen, Wayne Baerwaldt. Jack and Doris Shadbolt Foundation, VIVA Award, Vancouver, BC, 2010. SAW Gallery, Chaos Theories, Ottawa, ON, 1998. Participants: Anitra Hamilton, Adrienne Trent. Curator: Germaine Koh. SAW Gallery, Asides: asian artists speak, Ottawa, ON, May 1996. Lecture and screening series. Curator: Germaine Koh. Ottawa Art Gallery, Practice Ground, Ottawa, ON, Sep-Oct 1994. Participants: Ken Lum, Denyse Thomasos, Jean-Marie Delavalle, Adrian Gollner. Curator: Germaine Koh & Daniel Sharp. Vancouver Art Gallery, Annual Emerging Artist Lecture, Vancouver, BC, 2011. "Long Live Burnout! ", Artist-Run Centres and Collectives of Ontario annual conference, , Ottawa, ON, 9 Nov 2008. Keynote address. Author: Germaine Koh. "SOCS 411 - Professional Practice, SCLP 206/306 - Sculpture Projects", Emily Carr University of Art + Design, Sessional lecturer, Vancouver, BC, Sep-Dec 2007. Author: Germaine Koh. "SCLP 318 - Installation and Site-specific Art;", Emily Carr University of Art + Design, Sessional lecturer, Vancouver, BC, Jan-Apr 2007. Author: Germaine Koh. "Berlin in Dialogue with Canada - The Institutional Landscape", Art Forum Berlin, Moderator, Berlin, 3 Oct 2003. Author: Wayne Baerwaldt, Daina Augaitis, Marie-Josée Lafortune, Gabriele Knapstein, Kitty Scott; moderators: Sabrina Van Der Ley & Germaine Koh. "Special Topics in Sculpture: Public Works", University of Guelph, Sessional lecturer, Guelph, ON, Winter 2003. Author: Germaine Koh. "The Autonomous Object", University of Ottawa, Part-time Professor, Visual Arts Department, Ottawa, ON, 1997. Author: Germaine Koh. Universities Art Association of Canada, Downsizing: minimalism in the 90s Organizer and panel chair. Author: Germaine Koh. "Visual Workshop ", University of Ottawa, Part-time Professor, Visual Arts Department, Ottawa, ON, 1993-94. Author: Germaine Koh. Hunter College of City University of New York, Master of Fine Arts, New York, 1991-93. University of Ottawa, Bachelor of Arts (Theory and History of Art), Ottawa, ON, 1985-90. University of Ottawa, Bachelor of Fine Arts (Studio), Ottawa, ON, 1985-89.